The US Digital Registry – an authoritative list of government Twitter accounts – reveals that almost 30 have been suspended, several after tweeting in, er, Russian. Justin Littman, a software developer and librarian in the ‎Scholarly Technology Group at George Washington University's Gelman Library, identified the accounts in the process of archiving government tweets and found it odd that they'd been suspended – presumably for rules violations – rather than deleted or protected. 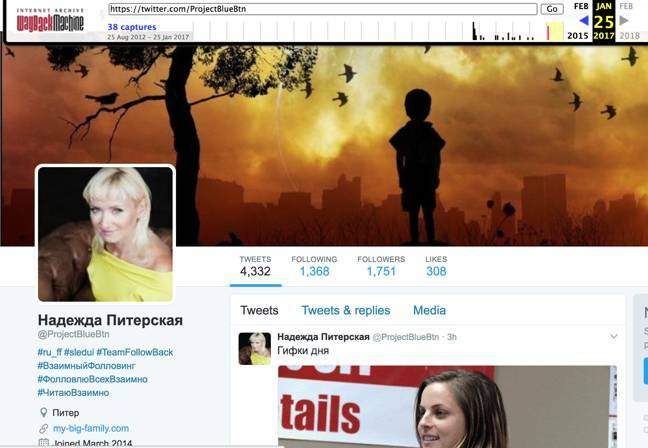 Having reviewed the history of the accounts as they appear in the Internet Archive, Littman believes that at least some of these accounts after being abandoned or deleted by government agencies were reestablished by individuals, including a few Russians, whose tweets subsequently triggered account suspensions. The account @ConnectStateGov, for example, was an officially recognized US government account in May 16, 2013, according to Internet Archive records. By October 14, 2014, it was tweeting in Russian. By December 17, 2016, it had been suspended – for spamming, we're told. On January 6, 2015, @ProjectBlueBtn was an official government Twitter account for a Medicare-related project to develop buttons to trigger APIs. By January 25, 2017, it was tweeting in Russian. Presently, the account is suspended. It does not appear that these accounts were used to spread election-related disinformation, though some sent spam – a problem that predates the 2016 election. Some tweeted in languages other than Russian and English, such as Chinese. However, for several of the suspended accounts that would be particularly attractive to those with political agendas, like @DoDLiveMil, the Internet Archive has no record of which tweets, if any, triggered the account suspension. Whatever these accounts were used for, Littman considers it curious that anyone would want a screen name like @ProjectBlueBtn that had been previously associated with a government agency. The Register has asked Twitter for an explanation. A spokesperson said the company was looking into the matter but could not comment on individual accounts. Twitter's policy says it may permanently remove accounts that have had no activity for six months. Thus it may be the agencies that registered these accounts failed to use them, then Twitter repossessed them and eventually made them available to others. We're told the screen names associated with suspended accounts are not recycled. It's also possible the one of more of these accounts could have been hijacked via compromised account credentials and then got suspended for misuse, though there's no evidence to suggest this. In the case of @ConnectStateGov, it appears the ExchangesConnect group in the Bureau of Educational and Cultural Affairs at the US State Department abandoned the handle for another name in 2014, @ECAatState, leaving the old one to be snapped up by a spammer. Littman contends the US Digital Registry – "the authoritative resource for agencies, citizens and developers to confirm the official status of social media and public-facing collaboration accounts" – should develop better processes for tracking the status of Uncle Sam's Twitter accounts. He also suggests US government agencies should submit the necessary information to get their Twitter accounts verified, designated by the blue check mark on the service, in order to limit the risk of impersonation.